Doreen Valiente is considered by many to be the “mother” of the contemporary pagan movement. She was an early initiate of Gerald Gardner’s in the 1950’s, and made many significant contributions as a writer and ritualist. Her books include “Natural Magic”, “An ABC of Witchcraft Past and Present”, “Witchcraft for Tomorrow”, and “The Rebirth of Witchcraft”. 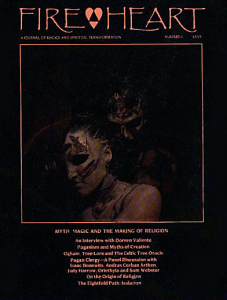 This Fireheart interview was conducted by Michael Thorn in 1991. To drink wine from the horns and leap the fire. FH: I must say that you’re not what I expected from your picture in “The Rebirth of Witchcraft”. You looked older and a lot more decrepit, and you’re actually very with it and lively and younger than I thought. DV: Well, I was rather a lot more decrepit. I’ve got a good day at the moment, but I have been absolutely laid out with arthritis. The trouble is that when it gets you, there’s not very much you can do about it. The doctors want to put you on all sorts of drugs which have a worse effect on you than the arthritis, and I’m very dubious of taking any of that stuff. The only thing that I find does any good is an herbal ointment. It does a great deal of good, but the trouble is it really stinks the place up. FH: Sometimes the best medicine tastes very bad, like cod liver oil. DV: They used to fill me up with that stuff when I was a kid. I don’t believe it ever did me the slightest bit of good, and I’m sure it was very bad for the cold. Arthritis is very limiting. When you’ve got it, there’s not a damn thing you can do about it. You just have to try and keep warm. And sometimes it gets into the joints of your hands and makes it painful to write. You don’t know where you haven’t got it when it really gets you. Actually, it’s probably a combination of old age and cussedness. DV: I don’t believe this stuff about the threefold return, you know. I’ve always been very skeptical about that, but I’m a lot more skeptical than I used to be. The older I get, the more skeptical I get. I don’t believe in all sorts of things that I used to believe in. FH: Where do you think the threefold idea came from? DV: I think old Gerald cooked it up in one of his rituals, and people took it terribly literally. Personally, I’ve always been skeptical about it because it doesn’t seem to me to make sense. I don’t see why there has to be one special law of karma for Witches and a different one for everybody else. I don’t buy that. But there’s an awful lot of things I don’t buy. FH: What do you buy? DV: Well, I’m really interested in reincarnation because I think it does explain a lot. I’ve got a lot of feeling of affinity with Egypt, you know, and I’ve got a feeling that I was around in that time. I remember reading a book about ancient Egypt which purported to talk a lot about the time of Akhenaton, and I found myself getting very angry about this book, almost wanting to sling it across the room and shout “It wasn’t like that at all!” And then I thought to myself, “What are you getting so angry about? This is stuff that happened centuries ago.” But I think reading that triggered off the feeling that I was around then. Otherwise I wouldn’t have felt so strongly about it. Since then, I’ve managed to recapture a few more bits and pieces, but of course, there’s no proof of any of these things. I’ve also got a very strong feeling that Mrs. Thatcher… Have you ever noticed how much she resembles the first Queen Elizabeth? And there’s a striking resemblance in the way that they ran the country, too. The spirit of Elizabeth’s reign was there very much. It wasn’t such a good reign for the common people. We’d better not stray into the realm of politics. FH: There’s politics in everything. Even in the Craft. DV: I wish there wasn’t. That’s one thing that makes me wonder whether the old coven structure hasn’t had its day. It served the purpose for which it was organized in the days when we were forced to be an underground group. I can well imagine that the coven structure was really what kept the Old Religion alive. But I think that’s all changing. Today, we’re becoming much more individualistic. For one thing, a lot of the real traditional covens were family affairs, and people lived in the same village and didn’t move very much, possibly for centuries. They knew jolly well there who they could trust and who they couldn’t. They would know that Uncle Harold was a devious old so-and-so, and that Cousin Herbert would sell his grandmother for fourpence. They knew who to trust and who not to trust because they knew these people. Likewise, you couldn’t try to kid them that you were the Lord High Adept and Great Mucky Muck because they would say, “Come off it, we knew you when you were a twinkle in your father’s eye.” Those were the circumstances in which the old covens were founded. They were strong because they were founded on Witch blood and on people who knew who they could trust and who they couldn’t trust. They were almost a product of the soil itself. FH: If you think that covens have outlived their usefulness, what do you think is the next mode of teaching and practice? DV: I think they will have to transform. Instead of politics entering into it, which is largely a matter of who’s going to be top Witch, I think they’ll be organized on a much more individualistic basis. People will practice on their own or with two or three kindred people. Instead of large covens like there used to be, there will be a lot more smaller groups, and they will do their own thing. I don’t think that’s a bad thing at all, within some sort of general framework. I’m not a believer that there’s one sort of orthodoxy that everybody’s got to conform to. FH: We’re not really concerned right now about the survival of the Craft. That’s pretty much assured. DV: Well, Gerald was concerned about that because he could see that most of the people in the Craft were old. He and Dafo were about the youngest ones there in the New Forest coven, so he told me, and he feared very much that once they were gone, who was going to carry on? People were afraid to initiate their children in those days, and they would wait until they were pretty grownup. Mind you, I don’t think that’s a bad thing. I don’t think children should be pushed into doing something just because their parents did it. But he was really worried that if they didn’t get some younger people into it, the whole thing was going to fade out. And he didn’t want to see that. Whether it would have done or not if it hadn’t been for him is a good question. That was the purpose behind his publicity seeking. FH: Did you ever expect, when you started working with Gerald Gardner in the 1950s, that Witchcraft would become the large scale movement that it has? DV: No. Never for a moment did I think that it would become the large scale movement that it has. Sometimes I sit down and I can hardly believe it. It’s amazing. I don’t think that it’s to the credit of me, Gerald Gardner or any individual. I think it is simply the fact that it was an idea whose time had come. FH: What do you think Gerald thought would happen as a result of his writing? That there would be a few covens? DV: I’m not sure he even expected a few covens. He just wanted to let people know that Witchcraft was still alive. It was only when people started writing to him, and I know he got sackfuls of letters. .. of course, the joke was that the more the Sunday newspapers denounced him, the more he got sackfuls of letters. And, poor old boy, he really didn’t know what to do about it. He started trying to meet up with a few people who seemed a bit sensible and it went on from there. But not for one moment, I don’t think, did he ever envision that it would be stretching literally from USA to Australia, and now the Soviet Union. A fellow Witch came round to have a chat with me the other day and told me that he’d seen an article in “The Times” about the reemergence of Witch covens in Russia and in other countries formerly know as the Iron Curtain countries. The spark has still stayed there alive, the ember is bursting into flame again. Also, of course, it gives the lie to all the clever people who say that old Gerald invented it all, because he didn’t, you know. He put it into a form which people could use. But I don’t believe he invented the basic idea behind it. I’ve had quite a lot of correspondence recently with my old friend, Aidan Kelly. What he said before, or what I thought he was saying, was that Gerald Gardner and I had entered into a conspiracy to deceive the public. Well, I wasn’t wearing that one and got riled accordingly. I think he’s accepted it now that I didn’t enter into any conspiracy to deceive people. With regard to old Gerald, well, . . I won’t claim for a moment that he was the incarnation of truthfulness, but I don’t believe he invented the whole thing. I think there was an old New Forest coven, and I think he did contact it. The big question, of course, is how much of the Witchcraft ideas that we’ve got today were brought in by old Gerald and how much were really traditional from the old New Forest coven. That’s the question I don’t know whether we’ll ever really find the answer to because, unfortunately, there is so much which is lost, and there is so much controversy about it. So much has to stay a matter of opinion upon which people must make up their own minds. If I was younger and had lots of money, I would make my basis down in the New Forest and try and do a bit of original research — try to hunt up some remnants of what really went on there. Whether it will ever come out, I don’t know. In those days, people had to cover their tracks a lot more than they do now. Believe me, the Witch who told Gerald that Witchcraft doesn’t pay for broken windows wasn’t kidding. In those days, it really was extremely dangerous to have anything to do, not only with Witchcraft as such, but with the occult at all. It wasn’t at all respectable like it is now. Far from it, in fact. People didn’t have the same sort of rights as they do now. There are laws now that prevent you from being put into the street if your landlady doesn’t like what you’re studying, or dismissed from your job because your employer happens to be an evangelical Christian or something like that. They can’t kick people around quite as much nowadays as they used to be able to. In the old days, people really were very much more vulnerable than they are now. They jolly well had to keep quiet, and they had to cover their tracks, and they had to be terribly respectable. Dion Fortune, for instance, certainly tried to have a mystical Christian side to her organization to counter-balance the active Pagan side of it. Unfortunately, eventually it didn’t work. But it was only people who were either wealthy enough to thumb their noses at their neighbors or were able to keep very quiet about things who could pursue these things at all. You wouldn’t walk into a public library in those days and find books like you’ll find there today. They wouldn’t be allowed. FH: So when Gerald’s books did come out, the people he was working with were not pleased? DV: Well, no. Old Dorothy was an educated woman. She had her head screwed on pretty well when she advised Gerald against dashing into print. I’m afraid discretion was not Gerald’s strong point, and he wanted to dash into print and reveal almost everything. She persuaded him instead to put it in the form of an historical novel. Well that’s fiction. But I think a lot of ideas come out in fiction which convey more occult information than books which are ostensibly written as nonfiction. Dion Fortune’s best books, in my opinion, are her fictional books. I must admit that I’ve never succeeded in reading “The Cosmic Doctrine.” Like the famous book in H. P. Lovecraft stories, it does not permit itself to be read. But her fictional books I find full of information and interest. FH: If the group that he was working with was doing rituals other than what he pieced together later, did he have a book of those rituals? DV: Whether there’s any truth in this or not I don’t know, but his associate, Mr. Cecil Williamson, who actually first started the Witchcraft Museum, said that Gerald had an old book which was not a very big book. It was a manuscript book, and he used to keep this very carefully. Unfortunately, one day when he was showing visitors round his museum in the Isle of Man, this book was stolen and the going of it has never been solved. Now what book that was I don’t know. It’s not, I don’t think, a book that I’ve ever seen. What the contents of that stolen book were, why it was stolen, and whether it will ever turn up again we don’t know. FH: In your opinion, what are the differences in how the Craft is practiced in Britain and America, and why do you think those differences exist? DV: I think we’re much less formalized over here. Of course, I haven’t been to America so I can’t speak from personal experience, but everything in America seems to be so much more organized, and in a way, that worries me because I think it’s taking some of the fun out of it. It’s all getting a bit heavy. I don’t know whether Americans are a bit more inclined to organize things than British people. Of course, we’re chronically disorganized over here, and we’ve got the great tradition of British eccentrics of every kind. I think we’re a lot more informal over here. We don’t hold big Merrymeets like you’ve got over there. It’s probably simply because we don’t have so much money. It must cost an awful lot of money to organize one of these. It must be great fun. FH: It’s a unique experience because you get together with people who have done lots of different things and their rituals — you can see what other people do. It’s very communal. It’s interesting because there’s such a variety in what people do in terms of witchcraft in the States. DV: They do try over here to organize something like that at Halloween. Shan Jayran has been organizing a festival, usually somewhere in Battersea, and I hear it’s been very successful, although I’ve never actually been up to them. But it’s not an outdoor occasion like you have over there. Basically, USA is a very much bigger country. You’ve got a bit more elbow room out there, you see. But we do manage to have some outdoor meetings and quite a few people go to them. but you can’t do it quite so openly here. You can’t hire grounds without the local church kicking up a frightful row and all that sort of thing. FH: It’s never without problem in the US either, though. Sometimes it takes very careful explanation to the campground about exactly what you’re going to do. DV: One of the things which we have been getting over here are all these yarns about what they call satanic child abuse, which, of course, they equate with Witchcraft. All that started off in USA, and a lot of it has been exploded in the USA and shown to be nonsense. So now it’s been imported over here — a whole new market. It’s been assiduously spread by certain of these extremist evangelical organizations. The horrifying thing is — and this is a really horrifying tale — that in Rochdale, the local social services and social workers, after attending a seminar in which they were indoctrinated with all of this stuff and given a list of indications of how to spot satanism and satanic abuse of children, which apparently they swallowed whole, swooped on these people’s houses at dawn and carted their children off. The awful thing is that they also managed, by legal means, to fix things so that not only were these people deprived of the custody of their children. but they were forbidden to say anything about it. That sounds incredible in a democratic society in Britain in 1990, but it is a fact. And it has only been recently that the national press has found out what is going on and has started to kick up a row about it that this has come to light. Some of the children have now been returned. Others are still, as they call it, “in care.” The parents were denied legal aid at first, but they are now getting legal aid to sue for the return of their children. There is going to be a big High Court case about it and a government inquiry, but these things have only come about because the national press found out what was going on and said, “What the hell is going on here in Britain in 1990?” I’m not saying, of course, that the children were not being abused. We don’t know whether they’ve been abused or not. Unfortunately, there is an awful lot of child abuse goes on. But that is a very different thing from saying that this is done as a ritual to Satan or as part of a Witchcraft ritual, and that is what these people are trying to make out. Also, the Chief Constable of Manchester has totally repudiated these stories of Witchcraft and satanism connected with child abuse, saying that his officers have thoroughly investigated it. They’ve found no bodies, no babies cooked in microwave ovens. That was one of the allegations, believe it or not. They’ve found no bones. They’ve found no secret meeting places, nothing. Not one of these stories that has been told over here has been backed up by any proof whatsoever. There’s one thing that puzzles me about these people who claim to have witnessed ritual murders and all this sort of thing. They’ll tell of things. They’ll tell it on television. They’ll tell it in books. They’ll tell it to the newspapers. But I’ve noticed there’s one place that you can never seem to get them to go and tell it. Why the hell don’t they go and tell it to the police? Very often we’ve had people making these claims here in Britain and the police have interviewed them and they’ve usually come out afterwards and made a statement saying that they could find no evidence of it whatever. But, these people say, “We couldn’t go to the police because we were too frightened.” Well, in that case, why are they speaking out now? Why aren’t they frightened now? If they’d gone to the police, the police could give them protection, as they very often do in cases of serious crime, and you can’t get much more serious than ritual murder. So why, if they were really concerned about this and they repented of it and they wanted to be out of it, why didn’t they go to the police with their story? That. in my opinion, is what you used to call the $64,000 question, and we’ve never had a sensible answer to it. And I’d like to ask it of all of them. These allegations of ritual murder were all over our papers at first, but I’ve noticed that they’ve been rather small lately, now that these investigations have been brought to a conclusion and the chief constables themselves have come out and said they have found no backing up for them whatsoever. In fact, some of the people who gave evidence to these social workers about satanic abuse now say that they were simply brainwashed into it by continuous questioning by these social workers. One girl said, “They just wouldn’t take no for an answer. They wouldn’t leave me alone.” Well, this is rather like the medieval witchcraft investigations. The inquisitor wouldn’t take no for an answer. As I say there is going to be a government inquiry and a High Court Case for the return of these children to their parents. Under the British judicial system, if there is a court case pending about something, you can’t have a lot of stuff in the newspapers about it while it is, as they say, subjudiciary. It’s not allowed. Afterwards, they can say what they like, but they mustn’t come out with a lot of stuff for and against until that case has been heard because that, they feel, is infringing on the privilege of the judge and the court. So we shall wait now with very great interest to see what happens when this High Court case comes out and the government inquiry comes out. It’s scheduled, I believe, to last for about six weeks. And it is going to cost the poor wretched taxpayer a few million. FH: There goes the poll tax. DV: Yes, there goes Rochdale’s poll tax. There is a certain element among the Christian churches of what I think they call the evangelical persuasion, which is very, very fanatical on the subject, not only of Witchcraft and satanism, but of everything whatsoever connected with the New Age, even vegetarianism. Anything which is connected with the New Age is under the influence of Satan. DV: Yes, that’s really what it’s all about, any independent thinking. I heard a lovely tale awhile back about one of these chaps. They were having a public meeting in a shopping mall, and they were giving out tracts and buttonholing people. One of them came up to a woman who was a Witch and said to her, “The first thing we want you to know is that God loves you,” to which the Witch, being very polite, promptly replied, “Yes, I know she does.” And the gentleman got very upset and accused her of being blasphemous. FH: What do you see as the interconnection between the Craft/Pagan movement and other movements such as the New Age and Women’s Spirituality movements? It does seem, with the Green movement over here and with the 20 years for Earth Day and concern about the environment, that the Craft is coming together with those things in some places. DV: Oh yes, I think it should. I think there’s a vital interconnection there. Why the Craft came out into the open in the 1950s was not really due to the efforts of any one individual, but simply because it was an idea whose time had come, and these other things are ideas whose time has come. They are going to be a part of the Aquarian Age. This is the historic movement that’s going on, and that’s what I find so very interesting to watch. I’m too old now to do much more except watch. But I do watch with great interest, I can tell you. We’re beginning to see now how a lot of the persecution of Witches in historic records was really very much concerned with the persecution of women and putting them in their place, as they regarded it. Uppity women were regarded as being Witches and suspected of being Witches, and a lot of the women healers were degraded to being regarded as Witches simply because they were women. Only men could practice medicine. Nowadays, we’re beginning to see how the connection between feminism and Witchcraft is not something that’s new. It’s something that’s been there all along. In fact, it’s something that’s vital at the foundation of it. FH: It’s an interesting resurgence all at once. DV: That’s the point, you see. The resurgence all at once. Why should that be? Simply because there is, I think, some sort of historic movement — what one of the old prime ministers called once “the winds of change blowing,” which is a very appropriate expression for the Aquarian Age. Aquarius is an air sign and it’s the winds of change that blow. There’s no way that anybody could stop it. It’s the wind of change that blew down the Berlin Wall.